So back on April 1st, 2011, I started doing statistics for RMN. More out of curiosity than anything else. And I kept doing it on a monthly basis for 5 years. More out of a sense of obligation than anything else. On a lark, and since I have a glut of shittier games on my Steam gift inventory, I am going to propose a quick event to gift 5 games from my Steam inventory to 5 people who identify the most interesting trends or takeaways from the Statistics posts from the past 5 years, as judged by me. Past statistics posts can be found in the first section of each statistics post. The previous year's stats can be found in the January posts of each year's stats. If you are keen on this, check out the old stats topics and find some neat trends or quirky stats or whatever and post about it here! I will pick the 5 I find the most interesting or intriguing and contact the winners to pick a game. (First come first serve. You have to be my friend on Steam.) I am partial to graphs. Wow, it was a lot more game-centric back then and is a lot more user centric now. Given the added columns of achievers, submitted reviews, articles (I would be a sad dragon back then! ), post rank additionally to the ms rank and other submissions.. a lot less small-fry user regular competition. No "I sodding post too much" competition, either. .. damn, nhubi would get a kick out of this! Given the added columns of achievers, submitted reviews, articles (I would be a sad dragon back then! ), post rank additionally to the ms rank and other submissions. Eh, sure? It IS a very striking difference in the dynamics. I won't go into detail diving, so I certainly won't do more. In the first statistics post, Sated suggested that these should be a monthly article instead of a forum post. kentona has missed out on 1800 Makerscore to date by not making these monthly posts into articles. I suspect this is the most interesting statistic to kentona. Definitely the obsession with post count and ranks. I'll have to do some investigation. did you know that craze has complained in 5/6 of topics about liberty beating him in post count? well, I now know what I will have to retroactively do if Liberty surpasses me in Makerscore. Don't give him ideas, guys! It's interesting to see just how many people have moved on and clearly left RMN behind, or significantly reduced their presence. There's just so many stories in that. I feel bored. How odd. Well, the first thing I notice, and probably the most obvious, is the slow rise of the amount of, well, everything, by a steady amount. The games called Forever's End, Pom Gets Wifi, and Hero's Realm are all in the most viewed section almost constantly, while Pom Gets Wifi and Hero's Realm both stay in the most downloaded games section. In the most subscribed section, is Forever's End, always. 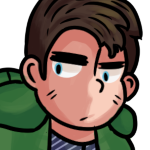 I've also noticed that the same people almost always appear in the same areas, though there are some exceptions, such as people who left a while back, and either stayed away, or came back. This list of stuff I could mention goes on and on, but I'm too lazy to say any of it. 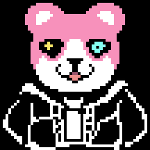 Really, I'm only doing this for VX Ace. Yes, this is my submission. Guess what, it's a Pom factoid. Kentona never keeps up to date. But yeah I don't really have anything else to say, so go ahead and take that as my entry. For anyone interested, here is the main public spreadsheet I'll be updating. At the moment, I'm focusing on the only statistic that matters: Makerscore. I have raw data in a different spreadsheet, but it's super huge. If anyone wants a personal analysis of their makerscore over this 5-year period, feel free to ask. Makerscore is earned by contributing to the site. Some contribute more than others. 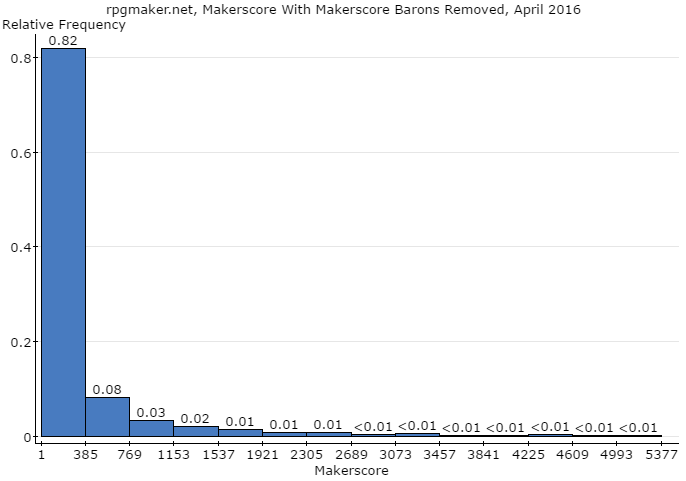 Some have been contributing so much and for so long that they dramatically skew the distribution of makerscore is dramatically skewed to the right. How skewed is it? All that <0.01 means less than 1% of the data falls within that particular range. You convert a relative frequency to a percent by shifting the decimal to the right twice. Now, 99% of users with at least 1 makerscore (MS) have between 1 and 5009 MS, while less than 1% of users have MS higher than 5009. The vast majority of users (93%) with at least 1 MS have between 1 and 1253 MS.
That's a bit better, but it's still so skewed we can hardly tell anything about 98% of the data (MS between 1 and 2689). There we go. Here's something you can see some finer details in, although it is important to note how narrow this graph's focus is compared to the first one. Hope this table displays correctly. Here's a screenshot of the table just in case. n: Size of the data set. Mean: One way to view an "average" value, and one example of a measure of center. Calculated by adding all of the values and dividing by n. It is affected by extreme values. Std. Dev: Standard Deviation. This is a measure of dispersion, which means how much the data varies around its mean, on average. Higher numbers mean there is more variation, smaller numbers mean less variation. Q1: "Quarter 1". 25% of the data is this value or less. Median: Also known as "Quarter 2". This is another way to view an "average" value, and is not affected by extreme values. 50% of the data is this value or less. Q3: "Quarter 3". 75% of the data is this value or less. IQR: Interquartile range. Another measure of dispersion, the IQR is the distance between each quartile. When using the median to describe the measure of center, the IQR is used as a measure of dispersion. Sum: Adding up all of the values in the data set. Why did I include this? Stay tuned to find out. The "Makerscore" row corresponds to the first graph, "MS Zoom 1" to the second graph, and "MS Zoom 2" to the third graph. The "Makerscore" row has the most comprehensive information. 75% of users with at least one MS have 215 MS or less. There is a huge amount of variation in the data whether you use the standard deviation or IQR as the measure of dispersion. This is due to users like kentona, who holds the maximum MS of 18,778. If you've ever felt down about your makerscore, no need to worry. The average makerscore is closer to 357 with the influence of RMN's makerscore titans, and 213 when you exclude their influence. 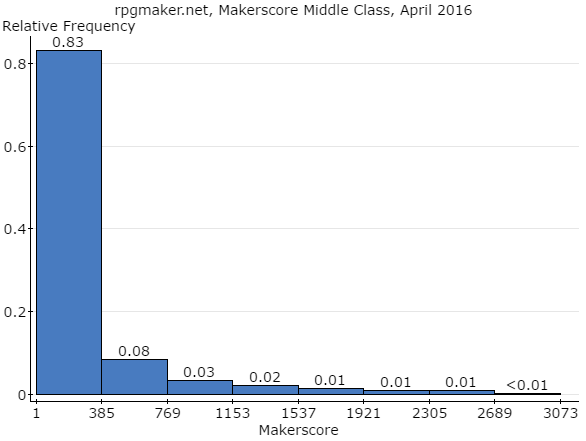 Or the average makerscore is 41 if you prefer the median value. Both of these are attainable with even modest contributions to the RMM's Content. Incidentally, the number of RMN's users with at least 1 MS (n = 4219) is roughly equal to the population of Orcas Island, part of the state of Washington in the United States. Presumably, we could fit these users into an area of 57.3 square miles (148 km^2). Further analysis to follow on the hypothetical properties of Survivor: Makerscore Edition. How much is Makerscore worth? So, we know who holds the makerscore in the world of RMN, but what does it matter? Is there any worth to makerscore besides lockerspace and social capital? More importantly, how does makerscore compare to the juggernaut of online currency, Bitcoin? 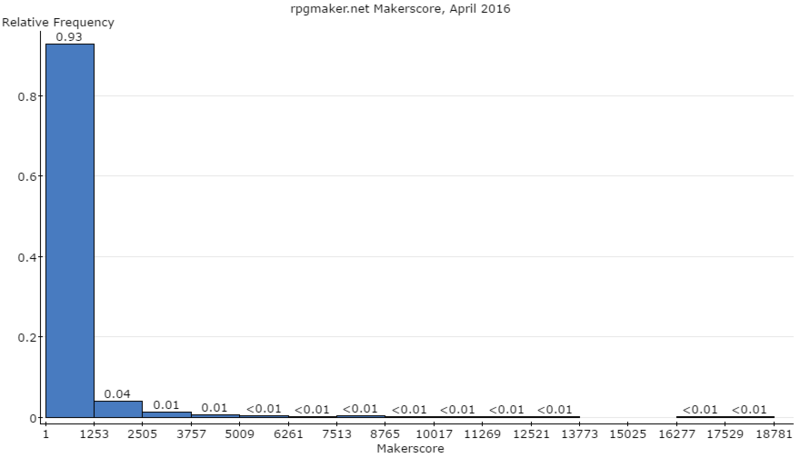 Well, I calculated the sum of everyone's makerscores earlier. We can use this to approximate the worth of RMN's collective makerscore value. If Makerscore were valued at a particular currency, then with the current exchange rate of 1 Bitcoin = x means that RMN collectively has y BTC. When deciding on which currencies to compare to, I went off of vaguely remembered mentions of countries I have seen RMN's users list as their place of residence, not actual demographic information. To find out how makerscore could potentially translate to a specific currency's comparison to Bitcoin, google "bitcoin to <insert currency here>" and use the value of 1,506,777 in the currency box. By taking an average of these theoretical MS to BTC values, we find that on average RMN's total makerscore is worth 2386.14 bitcoins. And, on average, 1 BTC = 3357 MS. In April of 2013, there was a goat for sale on the bitcoin auction site Bitmit. At 2.009 BTC, this goat would have cost about 6744 MS. kentona could have bought the goat, and perhaps barted for a second goat. 99.36% of users with at least 1 MS could not afford this goat. Luckily for kentona, he would have had to compete with only 0.63% of RMN's MS-having userbase for the goat. 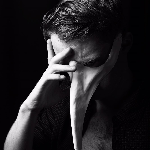 bitify.com currently has an auction listing for a random steam key, priced at 0.004 BTC, which would cost about 14 MS. kentona could buy 1,341 random steam keys. The average user (using the median) could afford 2. The most expensive listing on bitify, a 2009 Volkswagen Jetta SE, is currently priced at 15.29 BTC, which would cost 51,329 about MS. Not even kentona could afford this. However, if kentona spent RMN's collective MS, he could buy 156 of these cars, presumably as transportation around the RMN island. Whatever makerscore's personal value you to, now you know some theoretical real-world values of monetized makerscore. Ooh, that's some nice statistics right there. But I know one way to make them more accurate, and make the mean and median drop even lower to give everyone even more of an ego boost. kentona, can you tell us the amount of users with 0 MS? give penta all the games.